Accu chek active is used for the determination of blood glucose levels. It is used for determination of blood glucose levels and is majorly used by patients suffering from type 2 diabetes mellitus. It is a very useful aid during screening programmes and in tight glycemic control protocols. Accu Chek Active are test strips for determining blood glucose level manufactured by Roche, Germany. It is one of the leading brands prevailing in the USA. These blood glucose test strips are available in all the pharmacies, drug stores, and medical supply stores. The test strip contains a dry layer of enzymes, coenzymes, mediators and indicators and this dry layer converts blood glucose concentration into a signal which the glucometer reads. Patients suffering from type 2 diabetes mellitus. When should one check blood glucose levels? Blood glucose levels can be tested in a fasting state that is when one has not eaten food for at least 8 hours and is usually taken in the morning. These can also be checked 2 hours after a meal (postprandial level). Random blood glucose levels can also be checked. How to use Accu Chek Active (Blood Glucose Meter)? Accu chek active test strips are inserted in a glucometer. Capillary blood is taken by pricking the finger. A drop of blood is poured on the test strip. Wait till the glucometer shows the result. (usually, results come within 1 minute). How Accu Chek Active (Blood Glucose Meter) works? 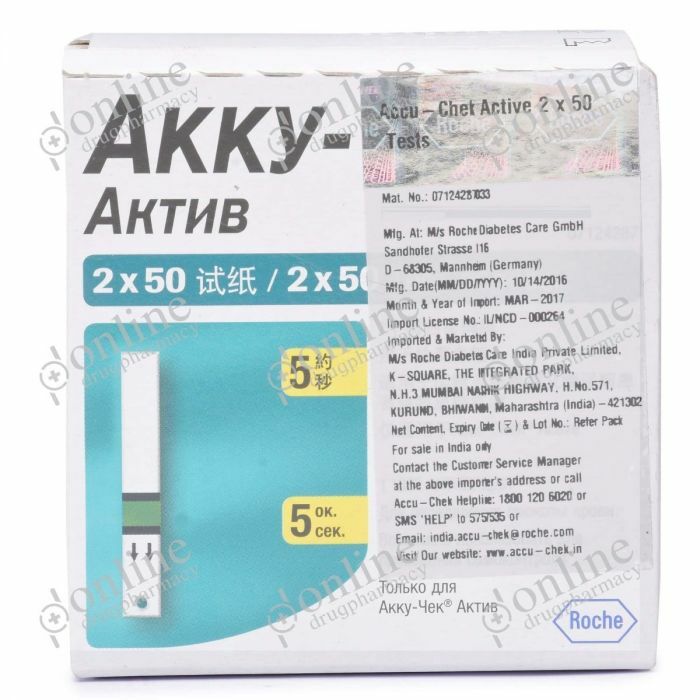 Accu Chek Active test stripes are a biosensor reagent complex which contains a dry layer of enzymes, coenzymes, mediators and indicators and this dry layer converts the blood glucose concentration into a signal that the glucometer reads. What precautions are to be taken before measuring blood glucose levels? The finger should be cleaned by the spirit and dried. Check the expiry dates on Accu Chek Active test strips. The first drop of blood should not be taken as it is somewhat diluted. The second or third drop should be used. The needle used for pricking should be sterilized. these drugs interfere with glucose measurement by glucose meter more than 6mg/dL.